It is a rewarding experience to work in a call center as it paves the way for social interaction with your colleagues as well as with people on the other end of the call. Almost all call center jobs provide abundant benefits, flexible working hours, and a safe and high-tech workplace. Apart from all this the growth prospects are blooming in call center jobs. When a graduate starts his career with the agent level or as call center executive, he can move up his career ladder to a senior officer, team leader, program manager and senior manager operations. They gain a good pay along with good opportunities. In order to get recruited the individual needs to perform well in the interview. Let’s see few call center job interview questions and answers. The following mentioned are few customer service interview questions asked in interview for call center. For this “Tell me about yourself” question asked at interviews, the individual should never ramble on but be clear with the context. Your answer can travel to any direction but make sure it has some relevance to your technical aspects. Your main personal qualities must also be referred while answering the question. Some of those qualities can be honest, team player, integrity, and determination. Inbound call center and outbound call center are the two types of call centers. In an inbound call center the call center associate or customer service officer will receive calls pertaining to customer queries. For example customer calling up the telecom company in order to know the present tariff plans bills, internet services and more. In an outbound call center, the customer associate will make outgoing calls to customers which can be business related or sales related. Examples can be call received from banks regarding personal loans. There is never a need to be an expert in understanding the company but the interviewer would look forward to basic understanding of the company. By answering about the company, the interviewer will get to know your interest in the company. There are ample resources from where you can get to know about the company and answer the same in the interview. For this call center question, it is important to have a ready answer because many candidates do not know their typing speed and hence develop a bad impression. Give an accurate and detailed answer regarding your typing speed. Make sure you have the information ready before you go for an interview. This call center agent interview question’s answer will present yourself as to how you would interact with the customer. The answer must be that you would politely greet the customer and introduce yourself. You will then ask the customer that how you can help them and listen to the requirements of the customer. You will then find an appropriate solution for the customer and provide them. The final step would be to check if the customer is satisfied and also check if they need any help further. With this interview question in call center, you can show your talent and skills that you can present your company. You can mention the interviewer about the talent and skills you possess and how they would be beneficial for the job role. You can also bring about new ideas and innovative thoughts which help in enhancing the profitability of the organization and credibility. You can answer that your education, experience, skills and personality are perfect for the position that you are about to work. You can mention that the intention or idea the company is working for is what you are looking for. The quality of service that is offered to the customer is what any business aims for. In order to achieve this, requirements, issues and needs of the customers must be understood. As an employee, you need to view from customer’s position and satisfy them by solving their issues. Not all customers are happy when they call up and hence the interviewer wants to know your ideas and if you would lash out, remember to recollect your previous experience and mention one if you had handled any angry customer. Mention that you would apologize for the inconvenience first, be patient, listen to them and promise them that their issue will be solved that day without fail. The appropriate way to answer this call center job interview question, is to mention your ability and highlight each of them. Stay calm when you feel pressure at work, patient and you would multitask, be concentrated on work and handle calls without frustration. You can also mention that you’re an organized individual where you prioritize work and be a productive person. If there are any emergency projects, you do not have a twist in your plans. This question is one which helps you make use of your strongest examples that you faced in your career. You can mention your natural focus and achievement by answering the question. There are many aspects that can be answered for this question regarding the process, cost reduction, people, change and lot more. Your participation and anything that you did challenged in your employment period which was successful and positive must be mentioned for this question. You can mention your goals, ambitions and skills that align with the job role. Mention that you are seeking an organization where you can grow in your career and also learn more technical skills. You can mention that you would prefer this job as it would identify your fine skills and help you climb the corporate ladder quickly. For this professional interview question you can mention few things that are in common. In order to make a call center successful, some factors are performance, excellent communication skills, consistency, incentives, leadership, management, and more. Also, remember to mention few examples that sync with all your statements. You can also mention the part you would play and create and make the call center a successful one. There are number of key features in order to execute customer service. Some of them are to be friendly, polite, courteous, professional and helping. You can mention that you are an extrovert person and would love interacting with people. And hence you can mention that call center job is a perfect job for you. you can mention that you like to solve issues of customers and also face new challenges in a positive manner. Along with all this the friendly manner of team members and pace of a call center job is what fascinates you. These are few common customer service representative interview questions which are asked in many organizations. Make sure to prepare for this question where you can mention your subject matter such as computer skills, communication skills, and other subject related knowledge. You can also mention about your skills and how they are associated with your present job role. You can also mention that you’re good at some language, marketing skills or at convincing customers. There are many features but few important key skills to become a perfect customer associate are good listening skills, patience, and problem-solving skills, multitasking skills, and concentration. This is a common question asked in all call center jobs because all multinational companies work for night shifts. Since this shift is where people need to work during the sleeping hours, candidates should think and answer in a positive manner. When such a question is posed, remember that call centers look out for candidates who are good at communication. Hence rate yourself from 8 to 9 out of 10 for this question. Greeting the customer would be the first step to being followed. Introduction to the customer would be next, ask the customer about how you can assist them today and listen to what the customer says in a patient manner. Solve out the issue by providing the customer with the best possible solution. Remember to cross-check the customer and find out if the solution was appropriate and the issue was solved. Also, make sure to find out if the customer is satisfied with the solution. Ask the customer again if they need any more assistance and then thank the customer for calling you. The above-mentioned interview questions and answers are common ones which are asked in a call center interview. Candidates who are looking out for jobs in call centers can run through the above hints and get recruited easily. Call center jobs are in high demand these days where many multinational companies offer best package with a number of benefits. Obtaining the job is very simple if the candidate makes sure to pass the interview with prior preparation. Almost all call center interviews have similar questions which are asked as mentioned above. The candidate just requires being confident and answering all the questions in a smart manner. The answers must be customer oriented where focusing on patience is another aspect. 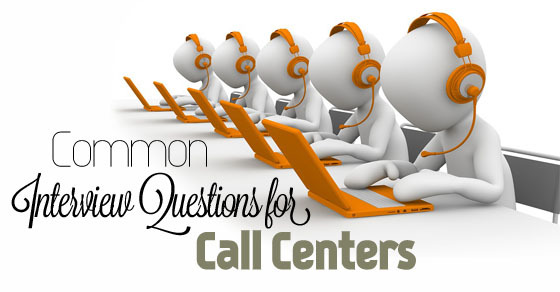 These valuable questions and answers are sure to fetch graduates a job in top call centers. Hence, graduates who are stammering with the interview can run through these tips and get employed.